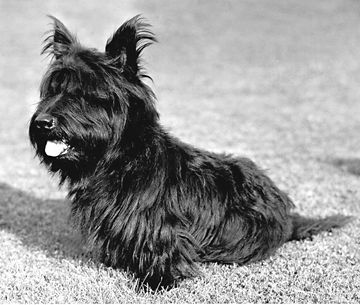 Fala, a Scottish terrier, was given to the president by Mrs. Augustus G. Kellog of Westport, Connecticut through Franklin Roosevelt’s cousin, Margaret “Daisy” Suckley. At first his name was Big Boy. Franklin renamed him Murray the Outlaw of Falahill, after a Scottish ancestor. Fala had a bone every morning brought up on the president’s breakfast tray. Fala got a full dinner every night. During the day, Fala would beg for food from the White House staff. He was so cute that he was fed all the time and became sick. The staff was asked not to feed him extra food. At night, he slept in a special chair at the foot of the president’s bed. Fala traveled with the president on long and short trips by train, car, or boat. He , of course, met many famous visitors and entertained them with his tricks. He could even curl his lip into a smile for them. In August 1941, Fala was at the Atlantic Charter Conference in Placentia Bay, Newfoundland with the president and Prime Minister Winston Churchill of England. In September 1942 and April 1943, Fala went on inspection trips of defense plants and visited Monterey, Mexico and President Camacho. In August 1943 and September 1944, he went to the Quebec Conferences. There was another incident on a sea trip aboard the ship Tuscalosa in the West Indies. It was a hot day. The sailors were trying to cool off. They were lying on the deck stretched out in a row. Their bare feet were lined up. Fala caused quite a commotion by moving quickly along the row licking and tickling their feet. And yet another time, Fala was with the President on a fishing trip to Florida. As the fish were caught, they were thrown in a pile on the deck. Quite a pile accumulated. They were all flip-flopping in the air as fish do. Fala began to flip-flop, too. It was such a fun game that he did it for several days. In April 1945, President Roosevelt died in Warm Springs, Georgia. Fala attended the funeral. He went to live with Mrs. Roosevelt at Val-Kill. He never really adjusted to the loss of Roosevelt. Even so, Val-Kill was in the country. It was a great place to run, play, chase squirrels, and even cats sometimes. Mrs. Roosevelt brought his grandson, Tamas McFala to live at Val-Kill, too, and be Fala’s playmate. Sometimes they would run off together and get into trouble. They came home hours later covered with burrs and mud. By the end of such a busy day, he was an exhausted dog. Sometimes he slept on his back with his feet in the air. He was so popular that he received thousands of letters from people. He even needed to have a secretary appointed to him to answer his mail. One letter dated August 5, 1947, was from a poodle named Abigail. Fala chased a skunk once, which was very unpleasant for everyone. The poodle scolded Fala for not acting with more intelligence and dignity. Abigail hoped that Fala would never, ever let that unfortunate incident be repeated. In 1942, a movie was made about Fala and his life in Hyde Park. Children and other visitors who come to the Roosevelt Museum and Library in Hyde Park, New York still enjoy watching it today. Fala is probably the only president pet to be memorialized in statuary. A statue of Fala stands next to one of FDR at the Franklin Delano Roosevelt Memorial in Washington D.C. The New York Times index contains many references to Fala from November 1940 to his death in April of 1952. An article in the Times appeared in January 11, 1942, VII, p. 11. The most famous remarks made by FDR about Fala were in his speech to the Teamsters Union, on September 23, 1944, which is available in The Public Papers and Addresses of Franklin D. Roosevelt, edited by Samuel I. Rosenman. Working With Roosevelt, by Samuel I. Rosenman. Harper Brothers, New York. 1952. Franklin Roosevelt at Hyde Park, by Olin Dows. American Artists Group, Inc., New York. Roosevelt and Hopkins, by Robert E. Sherwood. Harper Brothers, New York. 1948. FDR, My Boss, by Grace G. Tully, pp. 128-132. Charles Scribner & Sons, New York. 1949. Off the Record With FDR 1942-1945, by William Hassett. Rutgers University Press, New Brunswick, New Jersey. 1958. The True Story of Fala, by Margaret ” Daisy” Suckley. Scribner & Sons, New York. 1942. This volume may be purchased through the Museum Store at the Franklin D. Roosevelt Library, Hyde Park, New York. I’m trying to determine if Fala the scottish terrier was in fact breed in lucas county, Ohio by the then sheriff Jim O’reilly who raised them. Sorry, Don. We don’t have confirmation of that. Good luck in your research. That sounds really cool. We don’t know what the value would be, but let us know if you find out. Send me a photo and price. I have no idea of the worth. It’s amazing how crazy the country was about Fala. My mother had some Fala items, including a handkerchief and a record set of a musical entitled, simply, “Fala,” by Monarch Records (c. 1946). It was dedicated to FDR and was geared towards children. FDR had read the script for this musical and had some suggestions. 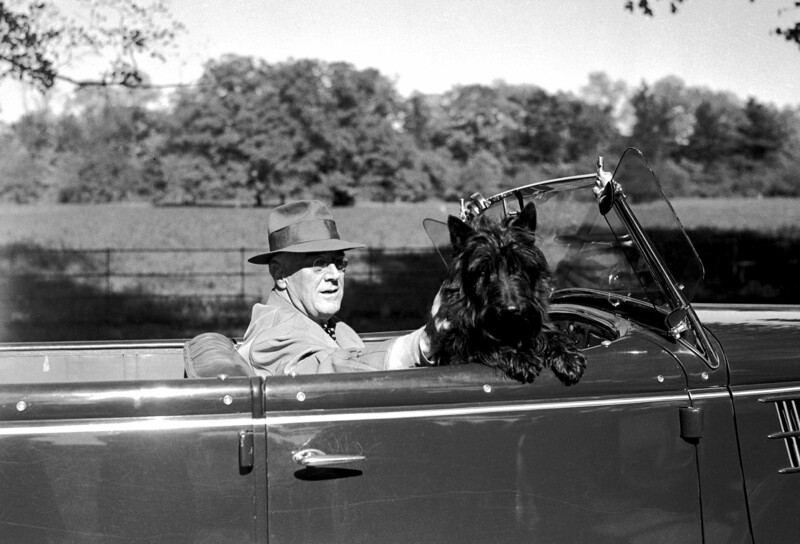 Yes, Fala was and still is the undisputed most popular presidential pet, at least in our book. This dog was even made an honorary private in the U.S. Army during WWII. Thank you for your recollections. The record must have come out not long after FDR passed away. Does anyone know the descendants of Fala and/ or if his bloodline is still extant or living or however that should be stated. Do we have any gr8, gr8, gr8….grand Falas around? Cindy, sorry, we’re not aware of the bloodline. Let us know if you hear. The dog ‘Fala’ had the original name John (‘Outlaw’) Murray of Falahill and Philiphaugh. John Murray of Falahill was a descendant of John Murray of Falahill. A Descendant of John (James Murray of Falahil) came during the Eighty Yaers’ War (from 1568 – 1648) to the Netherlands and became a Dutchman and was one of my ancestors So President Roosevelt and I are (far) kinsman. Can you tell me were I can find the familt tree. IS that all the animals he had we would really like to know if he had more. 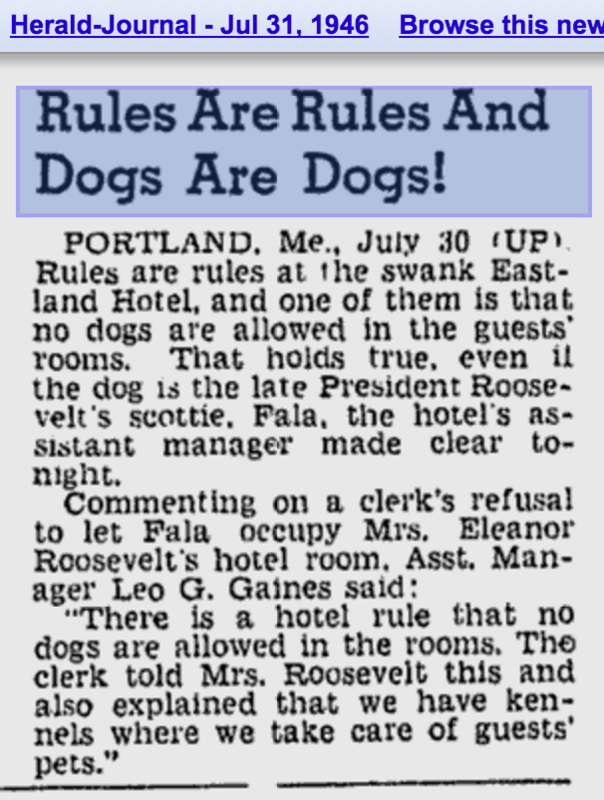 I remember reading that after the passing of FDR Fala was with Eleanor on a trip to Portland Maine and that the Eastland Hotel refused to let him stay in her room. If I remember correctly, she checked out of the Eastland and went to the Lafayette Hotel and was welcomed there. Can you confirm this story? The Eastland Hotel is still in operation in Portland. The Lafayette is now a subsidized housing facility in that city. Years ago my father told me he and some of his shipmates saved Fala when FDR was in Alaska? Is any of this true? I believe my dad was on the Cleveland during WWII. Perhaps you should specify that the Rose Garden where Fala is buried is not the famed White House Rose Garden. a little sailor coat !! I am Timothée from France, and I say passionately : Fabulous, Fabulous Fala, like Socks, Buddy, all my friends for ever.